One of the most often-cited examples of successful efforts to bring supermarkets into food deserts of New Jersey is the Food Depot in Newark. This store opened as a new-build, 31,000 square foot facility in Newark's Central Ward in 2012. The following video from PBS gives a pretty good look at the background of the store during its grand opening. 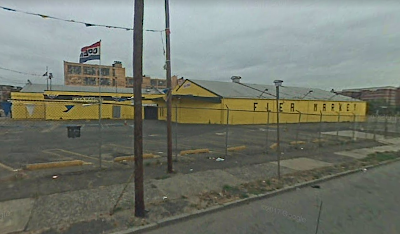 And for an idea of what the property looked like before Food Depot came, check out this street view from Google Maps. Future Food Depot Supermarket, 75B 1st St, Newark, NJ. Google Maps street view from 2007. 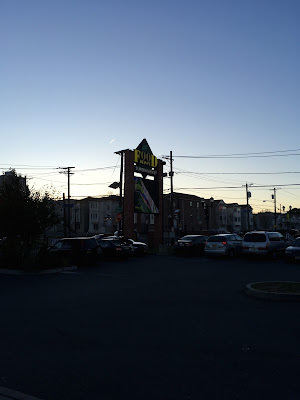 When I visited in the fall of 2017, I was happy to find a large, clean, and full-service supermarket. It hasn't really fallen apart since the opening. Food Depot is a member of AIM (Association of Independent Merchants) within Krasdale. They do have a cool LED animated sign on the street! There are two entrances. The main one here, closer to First St, leads to produce, deli/hot food, and a new bakery. The one on the other sides puts you out into the frozen/dairy section and a new pharmacy. With security like this... Anyway, you enter here, immediately next to the security desk. 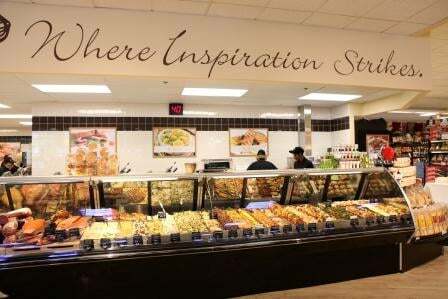 The produce department is spacious and well-stocked, with a very high ceiling. Looking back up towards the entrance. The deli is in the corner right next to the entrance, but it's not open to the sales floor. It might be a separate business, so it's only accessible from the exit. Looking along the exit hallway where the deli/hot food area is. Here we're looking towards the exit. Looking back into the store. It was a Friday night when I visited, so there were a lot of crates and boxes around, preparing for the weekend rush. The deli department is just past the hot food bar. They share a separate register and entrance/exit, so you can run in to just grab a sandwich or some lunch. There's also a seating area opposite the service counter. Let's head back to the produce department and continue around the store. Large, bright graphics. The decor is great because it's a mixture of value (the big pictures, the stencil font) and a more upscale feel (the dark colors, the lighting). A selection of produce like this in Newark's Central Ward is a big deal. Meat and seafood continue along the back wall, with a service butcher and seafood counter at the far end. Frozen seafood and meats continue in the back corner. Looking along the back wall to produce. Unlike many other inner-city independent supermarkets, Food Depot is really full-service. There's not much they won't have here. The second-to-last aisle is frozen foods, and the last aisle is dairy, with some more frozen foods along the front wall. Looking towards the back of the store from the front wall. It was not actually this dark--the phone camera messes with the lighting. The previous photo is more accurate. Looking towards the back of the store down the last aisle. As you can see, the ceiling is angled in some parts of the store. Overall, the ceilings are quite high, making it very difficult to get shots of the decor and the merchandise. The front wall is to the right here. The customer service counter is to the left here, with pharmacy past it to the left, and floral and bakery along the front wall. Notice that the "Thank You for Shopping With Us" is in the same font as Kings' decor! Customer service in the front corner opposite produce. How's 25 pounds? These have to be for restaurants or fast-food places, right? Is anyone actually buying 25 pounds of dry beans for their household? The grocery selection was a little limited, but obviously the store focuses on fresh goods. There was still a good selection of any groceries you'd need generally. ...from the deli/produce side. There is space that multiple smaller businesses have rented along the front wall, including a florist, a cell-phone store, and a bakery. Food Depot also operates a pharmacy on the far side, where there is also an entrance/exit. If you ever come to this store, try the tres leches cake and the mini donuts from the bakery. They're delicious. One last look down the hallway that forms the dairy/frozen side entrance and exit, with the pharmacy on the right and deli straight ahead. The front wall of the store is to the left. 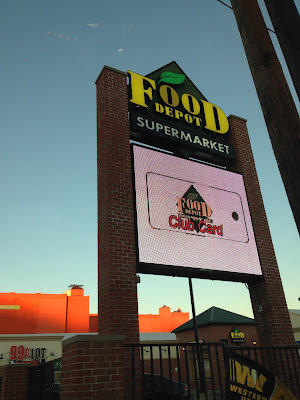 Food Depot is a must-see if you're ever in the area. It's a beautiful store and furthermore, exactly what the neighborhood needed. 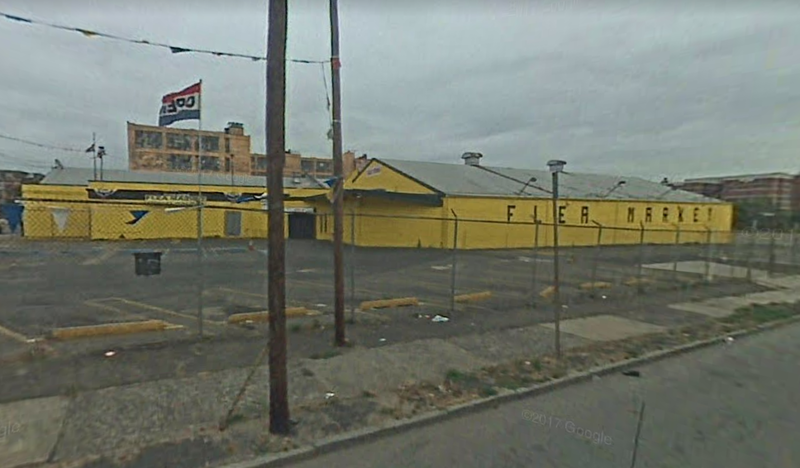 And their format must be working, because in 2015 the same owners opened another, smaller Food Depot in neighboring Kearny, NJ. 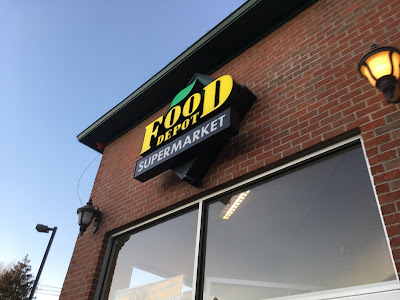 Is it odd that Food Depot uses the same font as Home Depot does? It's probably very intentional. Several businesses, uh, borrow The Home Depot's look, such as The Wash Depot at 4818 4th Ave in Brooklyn, NY. I don't get why so many places use it... it's a rather plain font, and is expensive to make signs for... too many cuts, bends, and ridges! Keep it simple.